Soak bread in water for a few minutes, then squeeze out as much water as you can. Chop shallot or onion and parsley finely. 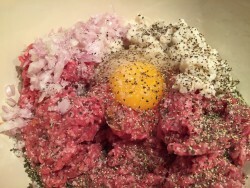 Mix all ingredients thoroughly with your hands in a large bowl. Form 6-8 evenly sized balls, then press them down slightly to flatten a little. 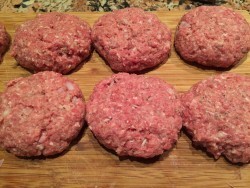 Smooth into even looking patties. Heat the olive oil in a large, non-stick fry pan to medium high. 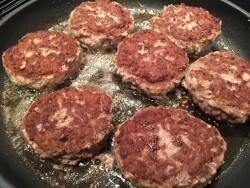 Fry the patties for 4-minutes until browned and crisp. Turn and fry for another 4-5 Minutes until cooked through and crisp. Place on a paper towel to absorb access oil and serve. 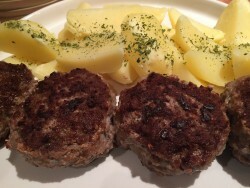 I like these hot or cold on a fresh bun with any burger style toppings, but they eat beautifully as a meat, accompanied by potatoes and a vegetable. Left over Frikadellen were devoured the day after as my school lunch on a sandwich. YUMMMM!